Alvin and the Chipmunks put a high-flying new spin on one of the most anticipated films of the year. 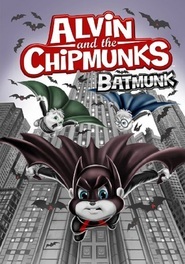 Batmunk is a thrilling adventure that'll keep you on the edge of your seat...with laughter! Simon (in the most heroic role of his long, brainy career) plays the Caped Crime fighter to mischievous Alvin's hilariously villainous Jokester, an arch criminal whose cult of crooked clowns has been stealing all the toys in the city. When the thieves go after "the greatest toy in the world," Batmunk decides to teach the bad guys that crime doesn't play!